Well it seems this last year has seen the Raptors once again go all vain and interesting. Not content with Flecktarn pattern as the BDU of choice, I finally decided to get some ATACS FG kit now that it’s available over here and not silly money. I like MTP, Multicam types but never enough to buy it. That and most airsofters use it nowadays so the raptors obviously avoid it like the fashion faux pas that it is. Looking at images of FG on the net it looks deceptively woolly and vague which I really like. So the plunge was plunged. 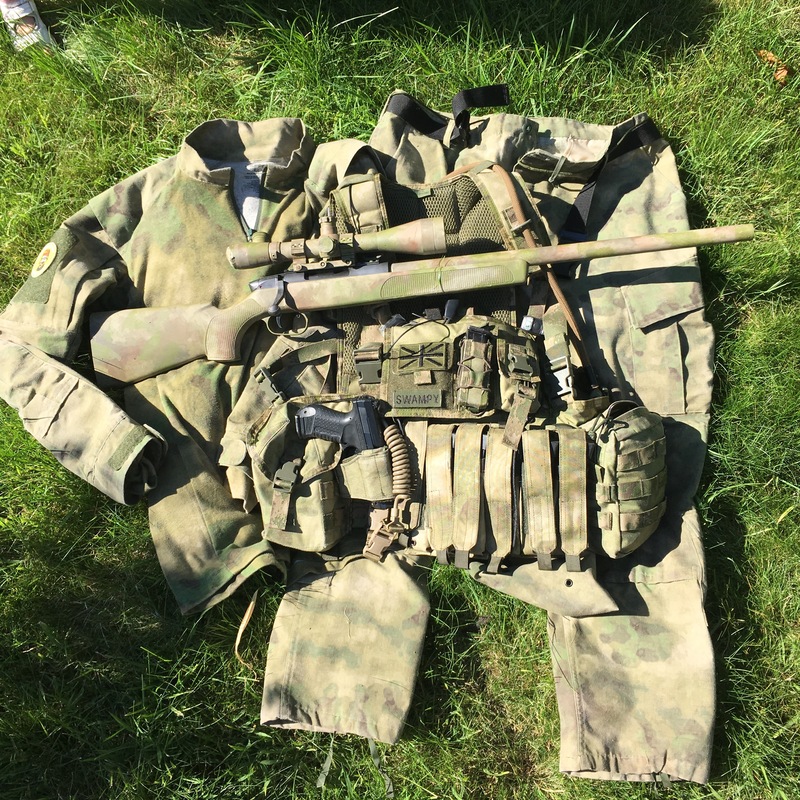 New BDUs and a rig with, for once matching pouches, bladder carrier and holster. Oooooh go on sir. Suits you. What’s it like in the field? Well I bought Propper BDUs as I’ve always liked them. Spider bought cheaper stuff, went all stunt man and ripped the arse out of his. Not a bad repair to do but still having the two sets up close I’m glad I splashed out a bit as I don’t imagine we’ll be changing pattern for a bit so it needs to last. In terms of colour fastness if you know the raptors you’ll know the BDUs never get washed. [yeah but seriously mate, those pants are starting to reek…. spider] Ever. It’s just bad juju and shouldn’t be done. That’s right. We generally stink but are all the more awesome for it. 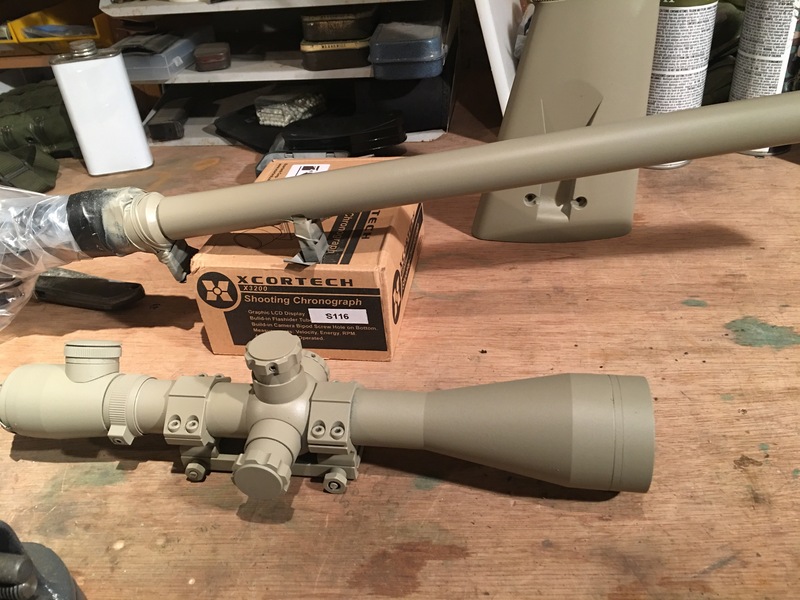 Also keeps the foxholes clear when needed, prevents aegs from failing and keeps peasants away. I’m alone in the team for this next part. Painting aegs. 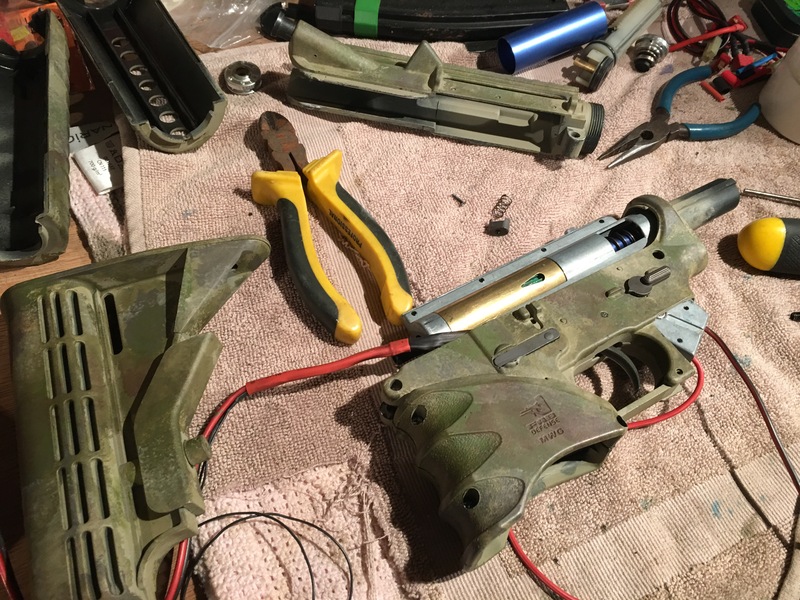 I have a penchant for skinning my guns with a paint job to match. 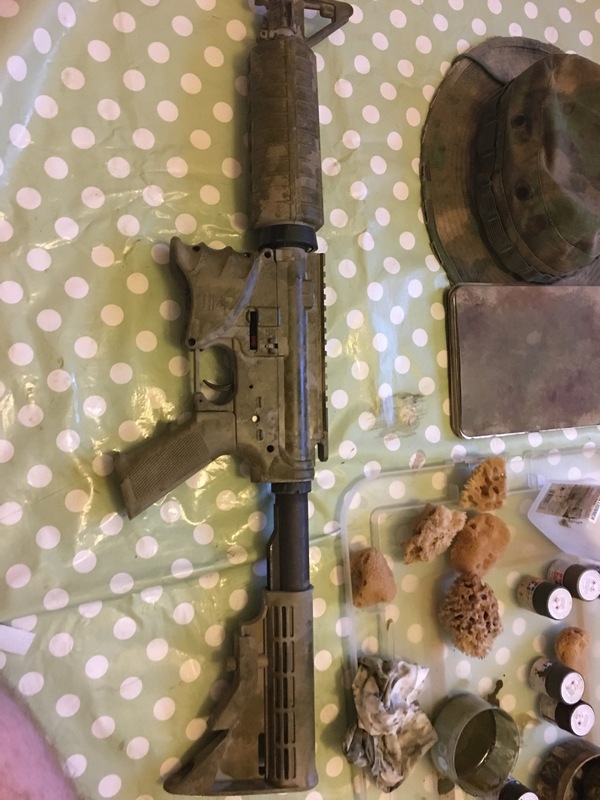 Did it with my systema and the Marpat I wore at the time (pain in the arse to stencil and paint) and it worked out well. 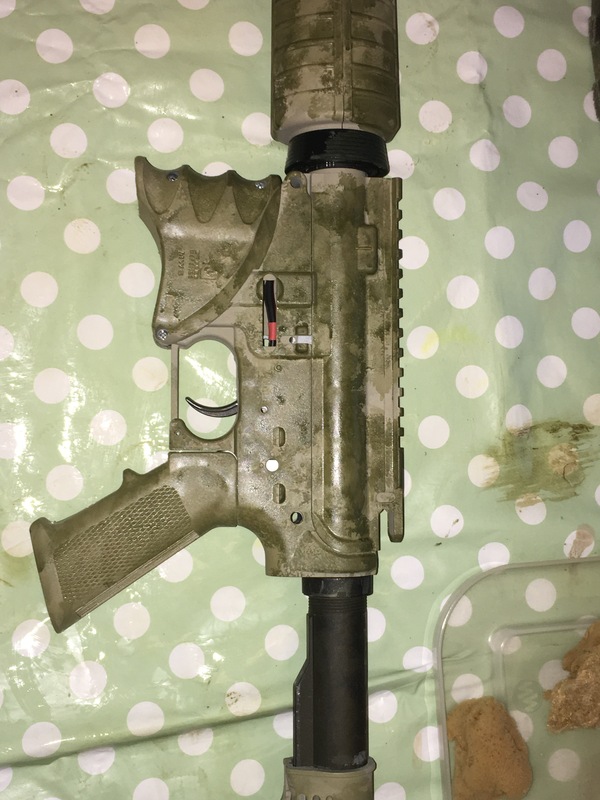 This time I’ve done my M4, ASP2 and will be doing my CO2 VSR when I get round to getting it off Milgeek. Might even do the ASG Scorpion. Might. So how did I do it. Well Milgeek will be along shortly I would imagine to show you how a proper modeller does it with an airbrush and skill. Me? I got half a dozen shades of Tamiya acrylic paints approximating my boonie hat in shade and had a bash. Good place for cheap Tamiya paints and small natural sponges is hobbycraft by the way. I Started by spraying some heavy weight notepad paper with krylon Khaki as a base to test on. 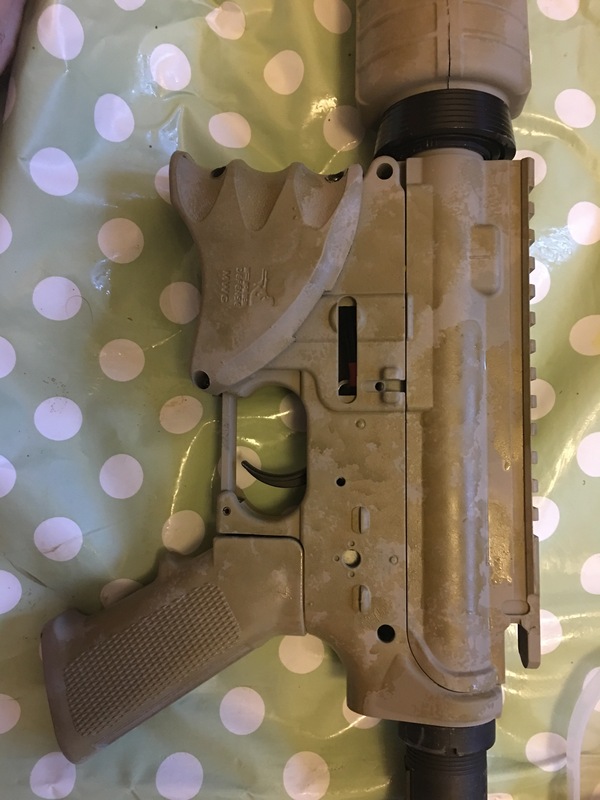 It seems ATACS FG runs light to dark as far as my eyes are concerned so this will be the base coat for everything, and krylon is excellent for Airsoft needs. After that it’s daubing time with various bits of sponge and redaubing with a sponge with thinners on to lift colour off and give the watercolour effect ATACS has. Works quite well if a little less defined than the actual thing. Repeating through increasingly darker shades finally to brown seems to fit nicely. The key seems to be working relatively quickly on partially dry previous layers to allow a little bleed between colours. Also repeating a few patches of previous colours here and there adds a bit of complexity. Still Airsoft never goes away even if real life is a bit busy on occasion. then things get interesting. 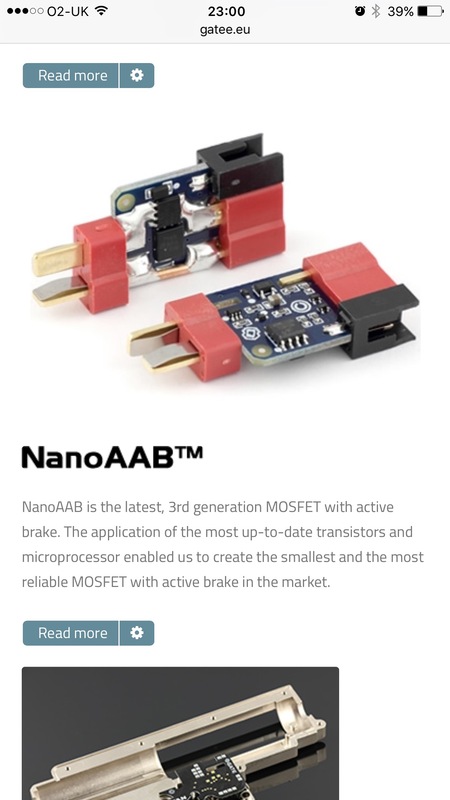 Especially for a non electrical type like me. Started by taking lots and lots of pictures of the current wiring as I stripped it down to ensure I could put it all back if need be. A word or two on the strip down – bloody awful. The SRC is a very badly designed V2 piece of kit. Shame as it runs great but the take down is complicated. Gear box internals are as standard however which is good news. This is the first time the box has been opened on my SRC and from the get go everything was clearly coated in shed loads of an unknown grease. First job – a clean down with electrical contact cleaner and a relube with a good quality synthetic grease containing PTFE. The PTFE aids in preventing what is known as stick slip in lubrication parlance. At the point of start up there is always a high level of friction between metal surfaces when they’ve been at rest. The solid PTFE keeps the surfaces separated and aids immediate start up. Not sure how much it adds to performance but the theory is sound. 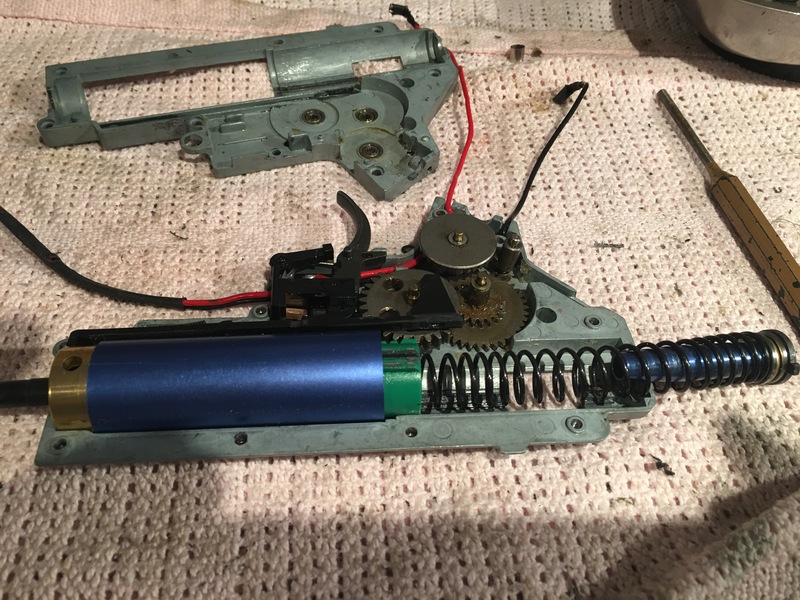 Decided to upgrade the spring at the same time and have a go at porting the piston to see what happens. It’s always been slightly underpowered so this should help. 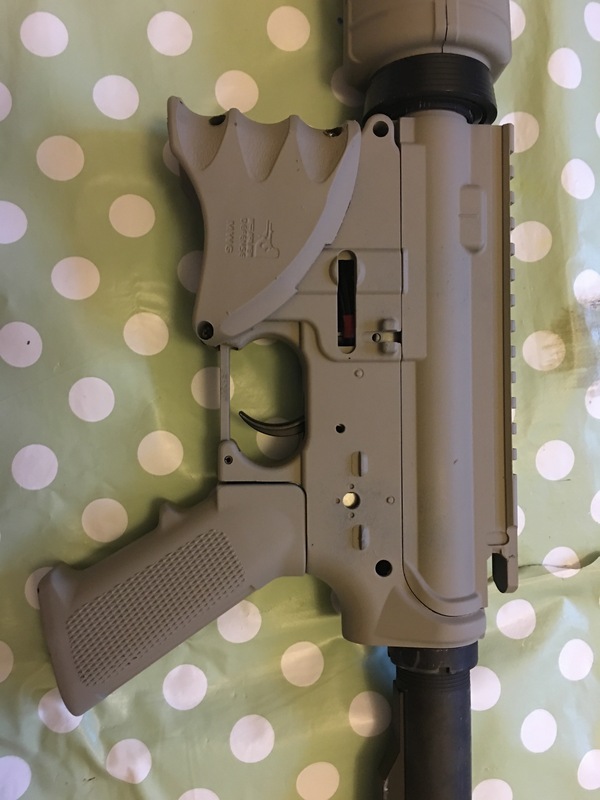 Cosmetically I’ve added a FAB defence mag well grip. 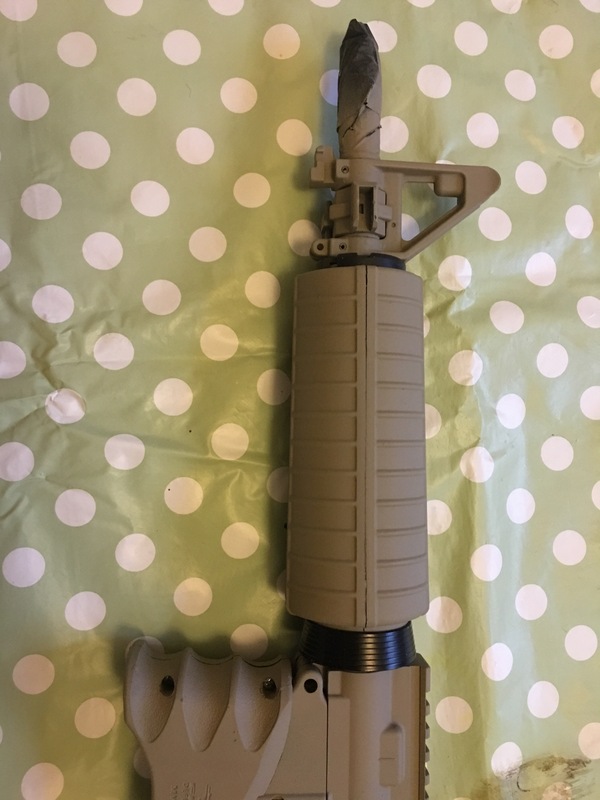 Had it for ages so it’s fashionably uncool in a magpul world but I don’t care as its comfy. 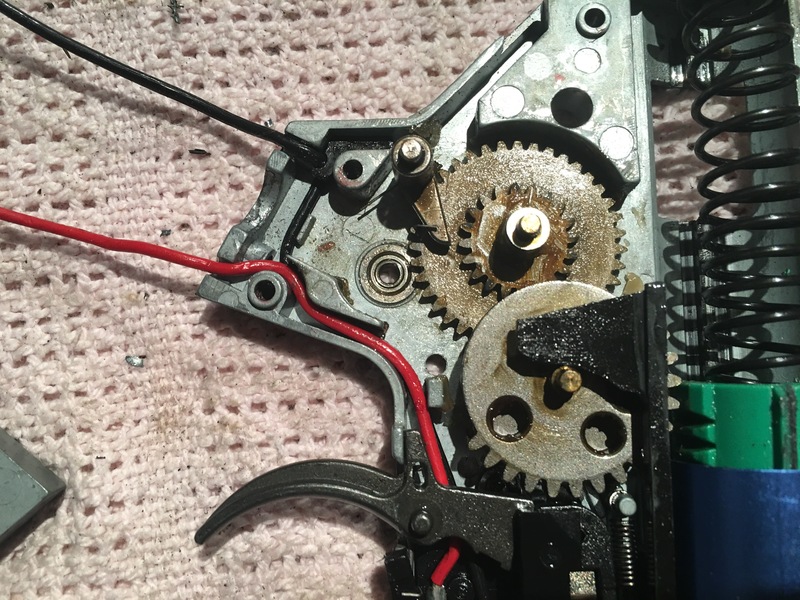 So the rewire…. Turns out that the twin core I normally use for such jobs is a tad too thick for the job. It caused a jam up between the hop unit and the upper receiver putting a twist on the hop onto barrel connection. Not good. Hmm. Still don’t like electrics. 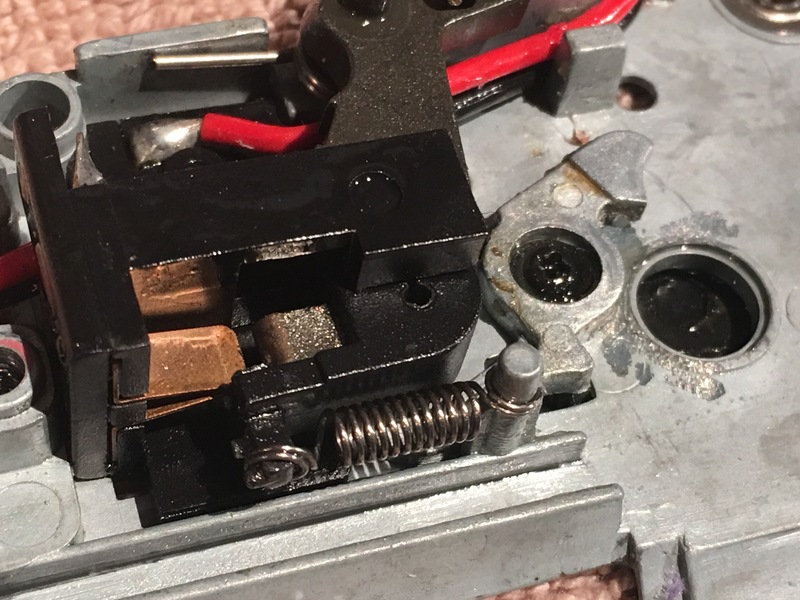 So the rebuild is on hold until the narrower gauge bendy silicone wire gets here from flea bay. Also took the opportunity to order a replacement mag catch and a CNC hop unit. In for a penny I for just over a few quid in this case. Money well spent. Stay tuned.